The completed mural as designed by Girl Scout Kate Burke of St. Ignatius of Antioch Parish, Yardley, for her Gold Award project is displayed in the parish hall. 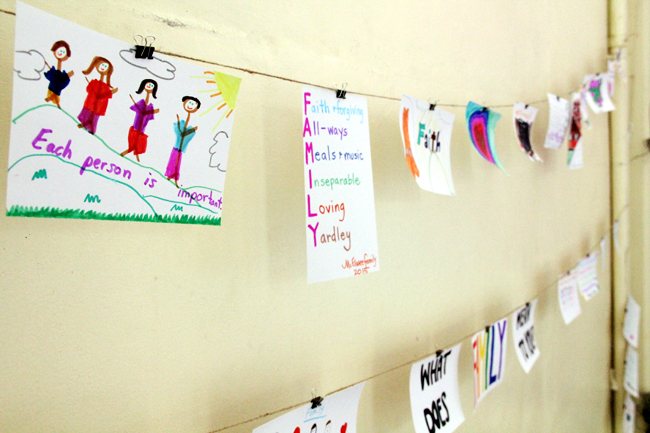 Parishioners who helped paint the mural also left notes of their experience, which were also strung and displayed at the St. Ignatius parish hall. Kate Burke has been doing children’s liturgy with her mother for as long as she can remember. So when it came time for the 17-year-old Villa Joseph Marie senior to pick a project for her Girl Scout Gold Award, it seemed natural to draw on her faith. 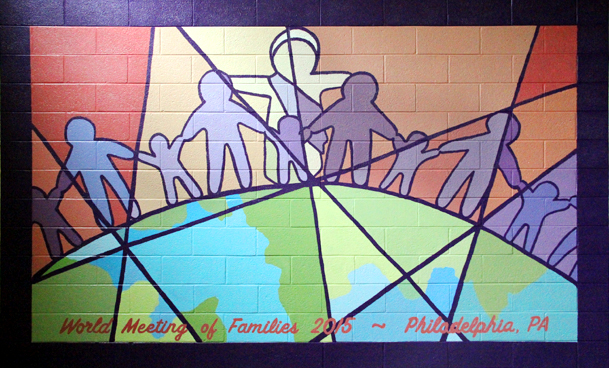 She decided to create a mural in recognition of the Sept. 22-25 World Meeting of Families 2015, and the Sept. 26-27 visit to Philadelphia by Pope Francis. The Gold Award is the highest award a Girl Scout can attain, and it was a goal Burke wanted to reach in this, her last year, with the organization. The requirements are rigorous: she had to put 50 hours into her project, involve younger people and create a work that benefits her community. She fulfilled those requirements and the results of her work were unveiled on Sunday at her parish, St. Ignatius of Antioch, in Yardley. The seven- by 13-foot mural depicts Jesus standing at the top of a curved globe with arms outstretched and reaching toward figures on either side, holding hands. A gathering of friends, family members and fellow parishioners attended the unveiling of the mural, painted with regular latex house paint, on the wall of the parish social hall. The reaction as the white sheet fell away from the piece ranged from applause to cheers to spontaneous praise. Burke accepted the praise but was quick to remind onlookers that she could never have finished her project alone. Volunteers traveled from the neighborhood and from as far away as Doylestown over a three-month period of time to help with the painting. 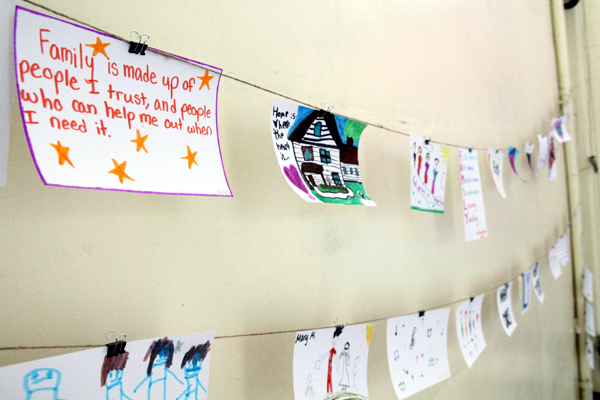 Burke’s siblings, her classmates, and children from the Vacation Bible School all worked to make their mark on the project. Sonia Foderaro, Burke’s project adviser, said she was so impressed with the young woman’s willingness to allow children from the parish Vacation Bible School, including one 4-year-old, to help that, despite the fact Burke was required to visit the work in progress only one time, she turned out just about every day. Burke said she did not want a straight-across drawing, so she included the curved earth on which her figures stood. Her challenge was the pastel colors used in the mural because she was unhappy with her first results, so she backtracked and ramped up the colors. The result is a mural that she and her family believe has not only historical significance, but will enable those 50 volunteers to look back years from now and tell other generations that they had a part in the work. “This is a great honor for us that the pope has chosen to visit Philadelphia,” Burke said. The artist’s mother, Deanna Bottcher, said her daughter was advised to follow her passion when trying to decide on a Gold Award project, and that passion was art. “She was always very reflective and when she found out about the World Meeting of Families and the pope’s visit, she went with it,” Bottcher said. Most of the guests at the ceremony were parishioners, and many were moved, some to tears, by the simplicity of the message meant to represent Pope Francis’ support of family life. Some had different interpretations of what they were viewing. Although Burke was representing Jesus as the main figure, parishioner Pat Joy saw that figure as representative of Pope Francis. “I love the pope. My wife gave me a book of his homilies, and every day I read one of them. He speaks of the love of families, of the poor, and of the planet. I see the mural as the pope watching over that planet,” said Joy, who is looking forward to going to Philadelphia to get a glimpse of the pontiff. Will Ventresca, also a member of St. Ignatius, circled the room taking pictures of the mural that his wife Christina and daughter Sophia helped to create. He thought Burke’s work showed an excellent weaving together of the parish community and the Girl Scouts. “We belong to St. Ignatius because it is a community, and the scouts are also part of our community. I like the suggestion of stained glass on the work. It makes it look as though it belongs in a church,” Ventresca said. St. Ignatius’ pastor, Msgr. Samuel Shoemaker, said Burke had approached him several months ago with her proposal to make a mural honoring the World Meeting of Families and the papal visit with a mural painted directly on the wall of the social hall. When he saw her plans, he agreed. “I see this mural as witness of the faith of her parents; a lot of inspiration of her faith came from her parents,” Msgr. Shoemaker said. NEXT: Hispanic Catholics mark 10 years of heritage Mass in Phila.